Toyota has applied for a patent on its flying car design. The wheels have spring-loaded, pop out helicopter rotors. It has the appearance of a quadcopter. If you decide you want to fly and get out of a traffic jam, you switch on the flying mode. The wheels start to fold upwards. Then, the wheels sprout rotor blades and spin up, providing lift. 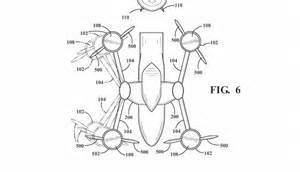 According to the patent filing, the wheels and rotors would be electric powered. It's not clear what type of engine would generate the electricity. The source could be hydrogen fuel cells, EV batteries or some type of combustion engine. In driving mode, the flying car would steer in a manner similar to tracked vehicles such as a tank. There are quite a few flying cars getting close to entering the airspace. Volvo announced it will start selling sister company Terrafugia's flying car The Transition in 2019. Uber and Larry Page's Kitty Hawk also are working on flying cars. It's an innovative form of transportation that starting to get lift.